CFOs are under the gun. They need to manage the growing burden of regulatory controls while being proactive advisors to the business and ensuring a focus on the bottom line. Complicating matters: today’s rapidly changing, highly competitive business environment, which demands timely information and insight yet pressures companies to pare resources. Forced to do more with less, CFOs must balance performance, efficiency, and risk—but that requires digital tools as well as the agility to manage volatility and drive enhanced decision making at reduced cost. Few CFOs have these capabilities. In fact, many finance organizations lack such digital basics as automated processes, the ability to integrate and analyze data, and a workforce with digital capabilities. The finance function is often hobbled by slow, legacy systems that don’t talk to one another. Without integrated data and a full set of digital tools, CFOs are unable to detect and quickly respond to real-time business changes. And they risk falling behind their more forward-looking peers, who are already transforming their business models and gaining a competitive advantage from their digital investments. Digital technologies—and their ability to transform the finance function with improved planning and decision making, streamlined processes, and better cost management—are critical to meeting today’s business challenges. To achieve the most value, the finance function must develop a digital strategy that aligns with the company’s overarching digital framework. However, going digital requires that you first put a solid foundation in place. Digital transformation often starts with the ability to capture, integrate, easily access, and analyze high-quality data. Fortunately, the costs of data storage, cloud infrastructure, and processing power have dropped by as much as 100-fold over the past decade. That’s important because predictive analytics, artificial intelligence, and other digital tools are fueled by data. Lots of it. Data capture and access can be enhanced with a data lake, an important piece of data and process architecture that supports the digital transformation. 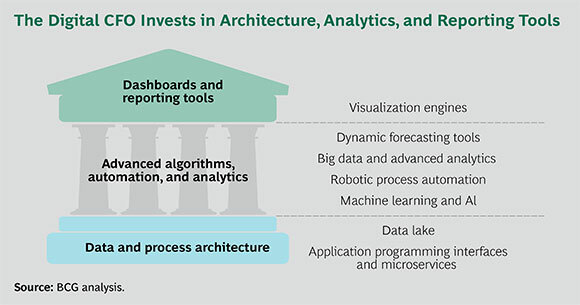 (See “Look Before You Leap into the Data Lake,” BCG article, September 2016.) Unlike data warehouses that store and organize only highly structured data, a data lake can accommodate virtually any type of data in any type of format, from unstructured data and raw data streams to documents, emails, and audio-visual files. As a result, companies can migrate to a single enterprise-wide data repository, minimizing silos while increasing information sharing and access. A data lake does more than store data: it transforms data on demand into a validated trove of information that can be easily accessed and mined. Software architecture makes this possible by processing incoming data, cleaning it up, and transforming it with high integrity—critical for regulatory reporting, more reliable modeling, and predictive analytics. Compare this with the expensive, IT-intensive approach of cataloging and cleaning up data in a warehouse operation before it can be used. Another advantage of the data lake is its ability to capture and process real-time operating and market data instead of relying solely on historical data stored in ware-houses. Besides providing better support for time-sensitive financial transactions such as credit analysis and money transfers, it leads to far more informed analysis and planning. Once the supporting architecture is in place, the foundation is set for key digital tools such as predictive analytics, robotic process automation (RPA), AI, and machine learning. Armed with a digital foundation, CFOs can begin deploying a wide variety of digital tools that can dramatically improve the performance and efficiency of the finance organization and increase the value it delivers. (See “Digital Tools for the CFO”.) Doing so will yield dramatic improvements in the performance and efficiency of the finance organization and in the value it delivers. Visualization engines work across systems to present data in a meaningful format. Dynamic forecasting tools improve forecast frequency and accuracy while reducing volatility by modeling financial outcomes based on value drivers. Users can change assumptions and analyze sensitivities with one click of a mouse. Big data and advanced analytics use large data sets to drive prediction and insights and improve visibility into an organization’s operations and performance. RPA automates rules-based activities using a software tool that captures and interacts with existing applications’ user interfaces and data as a virtual workforce, reducing cost while minimizing errors. Machine learning and AI deploy advanced algorithms that can be self-trained with enterprise data while removing human factors in the analysis loop, unlocking value in areas like fraud detection and currency hedging. Better Planning and Forecasting. In today’s unpredictable, fast-moving business environment, plans and forecasts tend to have a short shelf life. Digital tools can provide the flexibility, agility, and responsiveness needed to manage this new reality. With automated on-demand budgeting, planning, and forecasting capabilities, finance staff can revise assumptions and inputs and get instantaneous feedback. For instance, changes in tax policy or foreign currency valuations can be quickly and easily modeled. And “budgeting season” can be whittled down to a week. Digital tools also improve the accuracy of plans and forecasts by eliminating human bias and analytical error. Using predictive analytics and algorithms, some analysts have boosted accuracy by more than 20% and cut forecast volatility by nearly 50%. The end result is a more robust planning process that generates better forecasts—in less time and with less effort. Streamlined Accounting and Compliance. When preparing financial statements for regulatory submission, the accounting group must gather and validate the data in a carefully controlled environment to ensure that reporting is accurate and compliant and can be audited—a costly, time-consuming process. Digital tools minimize compliance errors and enhance transparency while saving time. Process automation can further enhance accounting control and efficiency, with benefits that extend across the accounting function to areas such as taxes, accounts payable, and accounts receivable. A fully digital control system can even use algorithms to ensure data traceability and integrity and improve the overall control environment. Enhanced Decision Making. With access to better, more timely data, finance teams can analyze patterns and trends, gain new insights, and respond more quickly to changes in the marketplace. AI, predictive analytics, machine learning, and advanced algorithms can reveal unexpected drivers behind business performance. For instance, one firm used these tools to flag key patterns that indicated a likelihood of nonpayment or outright fraud—such as accounts opened on a weekend or a newly installed account—and was able to eliminate 60% of nonpayers. Before going digital, the finance team had to detect fraud using labor-intensive methods such as calling customers and manually looking up addresses. Lower Costs and Fewer Errors. Digital tools are more efficient and less error-prone than humans—and they don’t need sleep. RPA can reduce the manual work associated with routine rules-based tasks and sharply reduce error rates and rework. As a result, staff reductions of 25% are not uncommon across all routine finance functions, from journal entries and reconciliations to payables, receivables, and beyond. Given that data and transactions are more easily audited, digital tools can reduce the need for external service providers. Clearly, digital technologies have the potential to dramatically improve the performance of the finance function. But most companies struggle to prioritize and focus their digital efforts. In fact, many simply aren’t prepared to go digital. Understand that digital investment per se does not guarantee digital success and positive ROI. Before they invest, companies, particularly those that are large and decentralized, should evaluate—and fix—organizational and process roadblocks that might limit the impact of digital transformation. Once they’ve done that, they are ready to launch a real digitalization effort. Our experience in a variety of industries suggests the following guidelines for getting started. Prioritize opportunities. Start by assessing the weaknesses, or pain points, in your organization—these offer the best opportunities for early digital success. Some areas may be saddled by high-cost, manual processes or data integrity issues. Others may be lacking in planning or analytical power and insight. So, it falls to the CFO to determine which specific opportunities will bring the most incremental value to the organization in the short term. Benchmarking your peers will provide further insight. But because no organization has unlimited time and resources, prioritize the most pressing initiatives on the basis of cost, complexity, time to results, and projected benefits. Think big and stay focused. Digitalization must be ambitious and far-reaching to drive real transformation, but don’t try to do everything at once. Start with test projects that focus on the highest-priority areas. Use these projects to lay the foundation, develop capabilities, and refine new ways of working. Then aggressively scale them across the function. Know what drives value. Digital technologies provide massive analytical power, offering finance teams new clarity into value drivers—not just financial drivers such as revenue growth and expenses but drivers at the operational and business unit levels. One company analyzed its products, costs, and revenues across every business and geographic area. The key insight: product proliferation was creating a reporting nightmare, consuming vast resources without adding value, and hampering management’s ability to effectively run the business. The company cut more than 90% of its P&L preparation and reduced related head count by 25%. Expand your digital toolkit. Look for ways to roll out additional tools—consistent with your digital strategy—for even bigger benefits. A global media company is deploying digital technologies to transform both its financial planning and analysis and its accounting and back-office functions. A new cloud-based financial-planning system helps identify key profitability drivers and enable dynamic forecasting. The system simplifies and links processes that previously involved discrete spreadsheets and multiple owners. Users can now easily test different business scenarios to understand risks and opportunities and make quicker, better-informed decisions, eliminating much of the guesswork, error, and manual iteration that were part of the legacy process. In parallel, the company is developing RPA capabilities to automate repetitive tasks and linkages between systems that couldn’t previously talk with one another. The company continues to expand its digital footprint. Track your progress and stay involved. Measuring the results of your digital efforts is critical, especially because many of the initiatives will be evaluated and refined over time. Knowing what cost reductions, productivity improvements, and other benefits the new tools are delivering is important input, as is communicating these benefits to your organization. In many cases, digital initiatives are self-funding. Savings can be reinvested in additional capabilities with long-term strategic value. Where possible, tie these metrics to the company’s overall digital objectives. Realign your resources. As the finance organization goes digital, many staff members’ roles will evolve. To fully capitalize on the new tools and processes, finance staff will need closer links to IT and training in skills such as data analysis and forecasting. New hires may be needed in the near term. Digital technologies may be the most effective way to manage the challenges of today’s fast-changing business environment. Drawing on digital tools and their many benefits, CFOs can transform the finance function and add more value to the business, all while balancing performance, efficiency, and risk. The key is to develop a comprehensive strategy to ensure that digital tools deliver the most impact. Forward-looking CFOs have already invested in a digital future and will continue to invest as the tools evolve. Simply put, it’s the price of gaining—and sustaining—a competitive advantage.